Anna Pearson reports on teenagers’ drinking, with lots of anecdotes from kids who like getting drunk. Unfortunately, the story’s a bit weak on data. The Ministry of Health showed reduced youth drinking participation, slight reductions in overall hazardous drinking among past-year drinkers but more substantial reductions in hazardous drinking among youths who were past-year drinkers. The MoH data is here; I’d summarised here. The main figures are copied below. 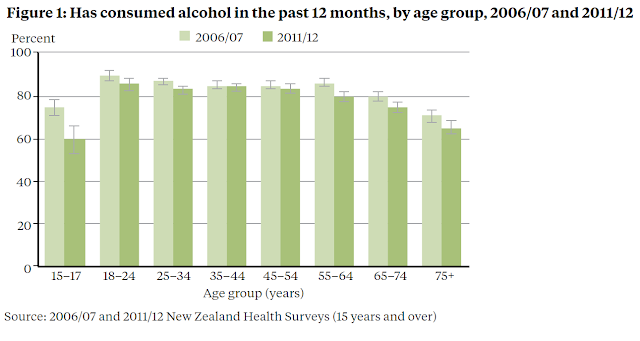 The Auckland Youth ’12 Survey also showed decreases in binge drinking, for both genders, from 2001 through 2012. 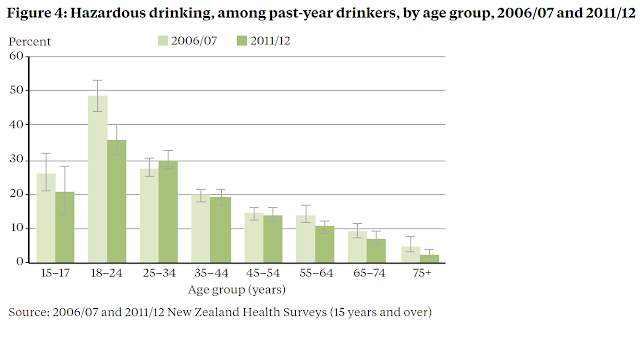 Another study found the proportion of 16- to 17-year-old females consuming eight or more standard drinks in a session in New Zealand tripled between 1995 and 2011. I’m curious to know which study she’s referring to. It’s possibly the SHORE data that showed an increase from ’95 to 2000, then flatlining since then, but it would be pretty misleading to put up the two dates and invite readers to infer a continuously increasing trend through the two data points. Maybe some new data is out that I don’t know about. If there is, wouldn’t it have been nice to put up the official MoH data that kinda shows the opposite?